Sign Language is a unique language skill that is rapidly spreading throughout homes in America. Sign Language is the third most widely spoken language in the U.S. and it is being used in deaf and hearing homes alike. 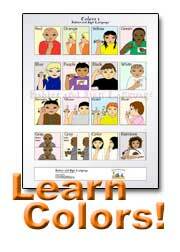 Parents are beginning to teach sign language at very young ages because the benefits are tremendous. 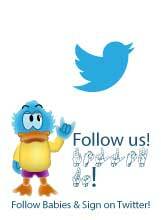 Children are capable of learning to sign before they have developed the physical motor ability to speak. Signing gives babies an earlier "voice" and early access to language and clearer communication. Signing (in any language) is known to enhance learning ability by establishing language connections in the brain. Children who learn sign develop larger vocabularies at earlier ages than their non-signing peers. 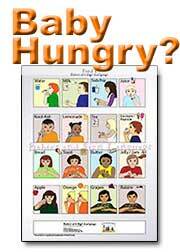 Early communication and language development also play a role in behavior. Children who can communicate their needs and wants are often happier. Signing and baby sign language reduce the frustration and temper tantrums that typically occur with young children who are developing language. The benefits of sign language for your grandbaby and grandchildren are endless! Another delightful growing trend in the U.S. is grand-parenting. More and more couples are having children and continuing to work outside the home, giving grandparents the opportunity to spend time with their grandchildren on a daily basis. For some grandparents this is a dream come true…spoiling the grandchildren by day and returning them to their parents by night. For others though, this newfound responsibility can be daunting and overwhelming. Imagine: just when you cleansed your hands of the responsibility of child-rearing…you are given the opportunity all over again! So what happens when two growing trends collide? 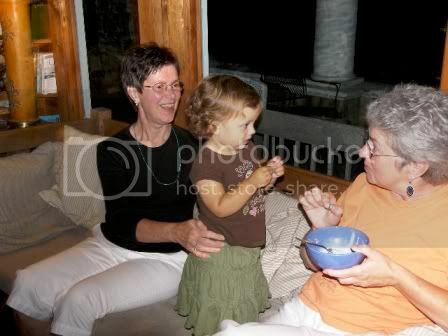 Sign language is a unique and wonderful way for grandparents to bond with their grandchildren. One of the most common complaints that Audiologists hear from grandparents is, "I just can't communicate with my grandkids. They speak too softly for me to understand them. I feel like I am missing out on that special interaction." Grandparents often have to battle communication breakdown on top of the two-generation wide chasm separating them from their grandchildren. Sign language offers the perfect solution. Learning sign language together strengthens the communication between child and grandparent and provides the perfect opportunity for that special bond. Not only will grandchildren benefit from the rich language building opportunity of learning sign language, but grandparents also benefit from the interaction and bonding that sign language provides. How Can I Learn to Sign with My Grandchild? 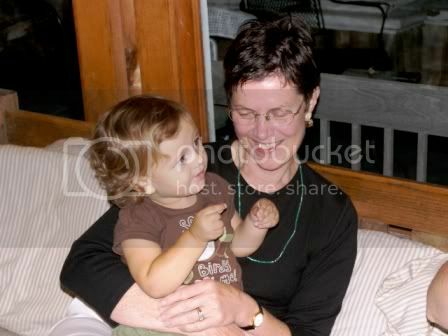 The opportunities for learning sign language with your grandchild(ren) are endless! Learning together can make sign language fun for you and your grandchild. Take a trip to the library. Begin with books and baby signing video tapes. Start small and learn some basic signs for colors, animals, and foods. Use dictionaries and websites. There are wonderful animated websites available for learning new sign language vocabulary. Keep a pocket sign language dictionary on hand for those times when you are out adventuring with your grandchild! Read a book together. Signing can make reading fun and providing another bonding experience for you and your grandchild. There are many storybooks that provide pictures for signs along with the script. Play student. If your grandchild is already learning to sign at home or at school, let them be the teacher. This provides a playful interaction that builds confidence for your grandchild. Cook together. Find fun recipes for cookies and treats and learn the signs for key ingredients. Then as you cook together, make a game and turn off your voice and use only your signs to communicate! See if you can guess the different ingredients and foods that you and your grandchild are using with each other. Fun! Have a special day. Choose a day of the week and make it special. Let your grandchild pick the activity or place to visit. Then spend time together learning the signs from your special day. For example: Have a fun trip to the zoo and take pictures. When you get home, you both can make a picture book of all the animals you saw and learn the signs for each! 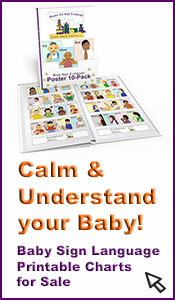 Please click here for more baby sign language activities. Signing with your grandchild should be fun! Be creative and you will undoubtedly experience the joy of bonding with your grandchild. 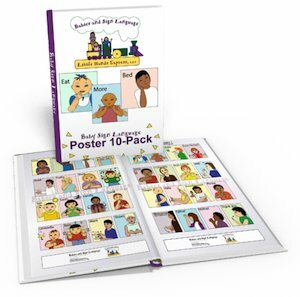 Learn together, communicate clearly and watch their language skills blossom! Grandparents! Do You Sign With Your Grandchild(ren)? Do you have a story or experience about signing with your darling children's children?! Please Share! TIP: Since most people scan Web pages, you may wish to include your best thoughts in your first paragraph.